Saint Mark’s is a school uniquely designed to honor childhood. Our campus, located in the heart of tree-filled Altadena, is on a scale that is welcoming and inspiring for children. Many of our classes are conducted outside or in labs, where students can develop their intellectual curiosity by exploring, learning, and playing in a dynamic, hands-on setting. Our school’s focus on these younger years provides the best foundational education possible. With a low student-to-teacher ratio, the relationships between students, faculty, staff, and families help create a vibrant home for learning and growth. 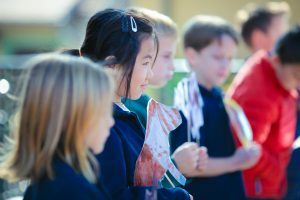 And as students transition into the upper elementary years, our curriculum and culture solidify their self-confidence before they head into adolescence. Our school prides itself on shepherding students through every step of these formative years of childhood, positioning students well as they transition to the next stage in their education and beyond. Discover more about our approach to education. Saint Mark’s is situated on a five-and-a-half-acre campus. Over the last decade, we have built special outdoor areas throughout the school to help bring the curriculum outside. Everyday, teachers and students use these new areas to engage with what they are learning through exploration, discovery, and play. Schedule a time to come visit our school.